With verdict on the National Judicial Appointments Commission still pending, a total of 384 posts in 24 High Courts of the country are vacant, being a clear indicator of the lack of manpower in the sentinels of justice across the country. The apex Court has 3 vacancies currently. A perusal of the graph indicates that Allahabad High Court has the largest number of vacancies, standing at 84. Allahabad High Court is hence working at less than half of its strength presently. Chattisgarh High Court is functioning on 40% of its strength, while Karnataka High Court is working on 51% of its strength. Out of the 24 High Courts, 13 are working on less than 65% of its approved strength, considerably waning the working capacity of the Judiciary. Madhya Pradesh, Sikkim and Tripura High Courts are the only ones functioning on 100% of its strength. Manipus High Court is functioning with 1 vacancy. 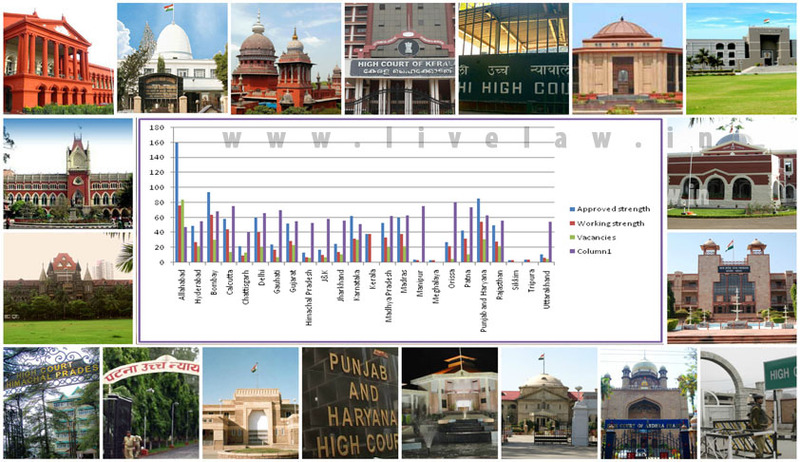 Even though Punjab and Haryana High Court has the second largest approved strength, it is working with 63% of that strength. With the High Courts functioning at 62% of their approved strength, the dream for reducing the pendency of cases is unlikely to materialize in the near future. The condition is aggravated by the absence of any mechanism to appoint or elevate Judges to the High Judiciary. As a precautionary measure, Law Ministry had decided to re-extend the services of three Additional Judges of the Gauhati High Court, out of the 22 Additional Judges of various High Courts set to retire in the next two months. As per a TOI Report, the three Additional Judges were on extension after May where their two-year contractual appointment had come to an end. The Government had also extended the tenure of seven Additional Judges of the Bombay High Court. The 22 Additional Judges who are set to retire are from High Courts of Chhattisgarh, Jharkhand, Bombay, Andhra Pradesh and Calcutta.